On his latest tour on Phi Phi island, Thailand, Dave Winterburn took a snorkeling shark watch tour and this is how he wrote it up. Early in the morning (06.45) we met outside Ja Soh’s curry house, excited to be awake at such an hour. The main briefing of how to swim on this tour so as to not disturb the sharks was completed the night before, but Charlie, our ever present guide, continued to detail how to snorkel in a group with the Black Tip Shark and not scare them away. On entering the sea at Phi Phi Shark Point our small group of 5 stayed close and quiet as if sensing danger. Moving into position upstream of the strong currents, we started to work together as one. One last final word from Charlie and he lead our small band over the shallows to be swept east by the surge of water. Floating no more than an arms length apart we looked all around. Pip was the first to see a 70cm black Tip Shark pup in about 1 m of water but it fled before all the group had a chance to spot it. Almost immediately a larger 1.2m Black Tip came straight towards our group but on seeing us, made a wide arc around us. It looked like he might circle us but lost interest and faded into the distance. It was about 5 minutes more before the next sightings and by this time we were in deeper water (5m). This deeper seabed had changed from the flat rocky surface the smaller Black Tips enjoyed to hunt their prey to some varied coral of stag horn and boulder coral. 2 large female Black tips almost 2m long glided by as if they hadn’t a care in the world. Swimming very slowly these gracious beasts moved at an amazing speed. It was a real thrill to see them... a real heart pounder. After the initial float down stream we made our way back up to the start of the run, sheltering behind the big rocks to make head way against the current. Our second time through the Black Tip Shark was incredible as about 5-7 sharks swam round us for about 5 minutes. Everybody was impressed, even the divers who been all over Thailand and The Red Sea. After the third run through the shark area, the group had had enough and were happy to return to the longtail boat for the next part of the tour. After a 25 minute ride we arrived in Maya Bay, well before the day trippers from Phuket. 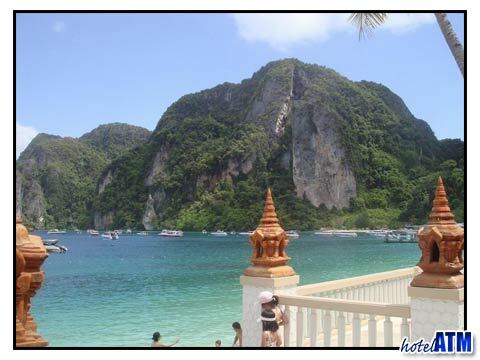 At this time Maya Bay is the Maya Bay before tourism. Quiet and majestic, it is inspiring. On the beach we ate breakfast of croissants and fruit mainly in silence, just soaking in the atmosphere. Unfortunately the at 09.25 Phuket tour boats arrived. Smiling to ourselves we continued by boat to the last part of the adventure and so to Loh Samah Bay. Underneath the verdant cliffs, the snorkeling at Loh Samah was colorful and varied. The clouds of fish and the coral offered a mixture of beautiful sights rarely enjoyed in Thailand. At 11 am we returned to Phi Phi Don fully satisfied that a great tour was had by all. Customers must be able to swim and have snorkeled before. Minimum age 12 years old. They help by •	Extra buoyancy of the wetsuit makes it easier to swim. •	Helps protect the body in the shallower areas against rock and coral •	If there are jelly fish in the water it helps stop their irritating sting. The Black Tip Shark is found all over the world. The 10 sub species are found as far apart as the Caribbean the Great Barrier Reef and since the Suez canal opened at the turn of the last century in the Mediterranean as far as Libya. The 10 sub species have varying traits and are known to nip snorkeler's ankles in the Caribbean. The Black Tips of the Andaman Sea are timid and shy away from human contact, though are inquisitive if they think they are in no danger. They skim the broken reef looking for parrot fish, mullet and squid at sunrise and at sunset. Up to 2 meters, this shark is impressive. The larger ones hang off the reef and rocks in the deeper water. The smaller ones can be found in less than 0.5 meters of water. Females are generally fatter than the male. Females give birth from 2 -8 pups in September to November. 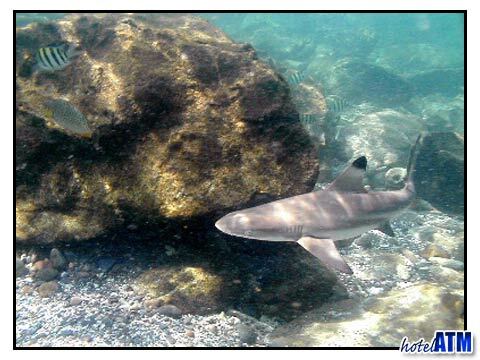 Black tips are found in many areas on Phi Phi island but none more regular or more concentrated than at Shark Point. The black tip Sharks will not swim under snorkelers and so it is important for all customers to stay in a small cluster groups, no more than 2-3 meters apart from 2 other people at one time.